Note 2: My students in China would be interested to learn that Coach Taylor, as a high school football coach with a “losing record,” makes 24 thousand dollars a year, while his wife earns $6000 working part time in a flower shop (2006 figures). This is not a high salary in America, which helps explain why they cannot afford to pay for home or car repairs, much less to buy a new car. Note 1: During the games, you probably won’t be able to understand the announcer’s words. Many words are used in non-standard ways to “report” sports action. So, just try to watch the action. Here are the basics of American football: one team has the ball (they are called “offense”), and they want to get to the goal (also called the “end zone”), while the other team (the “defense”) wants to stop whoever has the ball. If the offense can’t keep moving forward, then the other team gets to try. (From the time the ball is touched to the time it stops is called a “play” or “down,” and the offense has four downs to move at least 10 yards/meters.) If they make it to the “end zone” then it is called a “touchdown;” when this happens, the referee (and many fans) hold both arms straight up. Note 2: Football “scoreboards” are used in the movie to show you which team is winning. High school scoreboards usually refer to the teams as “guest/visitors” and “home.” In one game, for example, it’s guest 23, home 0 (so the Eagles—playing on their “home” football field—were beaten badly). Normally, a team wears white when they are the visitor, and their own color when they are at home. Coach Mark Richt: In this film, he plays Coach Taylor’s former coach; in truth (at the time the film was made), he is the current head coach for a powerful football team (the University of Georgia Bulldogs). Coach Richt has posted an article about his own faith at http://www.uga.edu/teamunited/testimonies/mark_richt.htm. Christian: someone who believes in the basic truths of the Christian Bible, in particular: (1) Jesus is part of the Trinity (a 3-person union of Father, Son and Holy Spirit in one God); (2) that sin (human imperfection) makes a human-God relationship as impossible as a relationship between a dirty stick and a hot fire; (3) that Jesus’ death on the cross brings forgiveness of sin to anyone who believes; and (4) that Jesus was raised from the dead to show God’s power, both to do miracles and to forgive sin, and thus to allow sinful humans to nonetheless have an eternal relationship with a holy God. A Christian is not simply someone born in a western culture, but someone who is an intentional, personal follower of the teachings of Jesus. *pregnant: to have a baby growing inside you; also called “to be expecting.” If a pregnancy test is “negative” it means that she is not pregnant; “positive” means you are going to have a baby. revival: a time when many people become Christians, or get serious about obeying the Bible, at the same time. Sometimes hundreds of people at a particular school or work place experience this without any natural explanation. History even records this happening from time to time on a national or international level. Christians believe that this is something “supernatural” that God does in answer to the prayers of someone like Mr. Brookes in this film. If you are a medical student (like my KMU students, when I created this page), read dialog 7 with a partner. What do you think of this doctor’s way of telling his patient bad news? What would you have said to the coach? 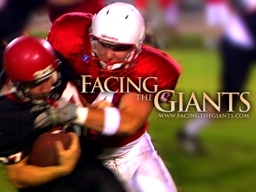 Describe Coach Taylor’s “troubles” or “giants” during the first part of the movie. Christians believe that many people refuse to turn to God unless their lives get desperate. Is that true? Why or why not? Read dialog 10. What does David’s father mean by: “Your actions will always follow your beliefs”? Talk about a time when someone’s actions were influence by what they believed about a situation. Read dialog 11. What does Mr. Bridges mean by: “bloom right where you’re planted”? Look at dialog 14. What did you think when a parent secretly gave the coach a truck? This would be VERY unusual in America! Do you think this would ever happen in your home country? Tell about a time like this, or explain why it couldn’t happen. Say these dialogs out loud with your friends; it will help you prepare to watch the movie. Blue parts below are particularly important. The underlined words are defined in the vocabulary section. 2. Coach Taylor: Did you think you were pregnant? Brooke: I don’t know. I just wanna be pregnant so bad that my mind plays tricks on me. You know, it’s been four years since we started trying. 3. Coach (summarizing their problems): So we’ve got a leak in the back room, the dryer only works half the time, the car’s dying on us, and now the stove’s broken. No wonder I’m losing my hair. 4. Coach Taylor (talking to a rebellious player): You can’t judge your father by his actions and yourself by your intentions. It just doesn’t work that way. 5. JT: When a black man goes bald, he still looks good. Look at Michael Jordan, George Foreman, Samuel L. Jackson. Classy-looking brothers. Who you got? Kojak? Yeah, Coach [is] gonna get him some [hair] plugs. 6. Brady: [Does] That old man still come every week to pray in the hallway? Coach: Mr. Bridges. Prays for the students as he passes their locker. JT: How long has he been doing that? Coach: [He’s been] praying for revival since before I got here. Lord knows we need it. Apathy in the school’s as bad as our football record. 7. Coach (after a doctor tells him that he has a medical problem, which is keeping his wife from getting pregnant): What does that mean? Is there a procedure? What are my options? Coach: We can’t afford that. Doc: The other option is to adopt a child. But it’s about as expensive either way. If you’re interested, I’ll put you in touch with the local agency. I realize this is difficult for you to hear, but at least you and your wife can make the best decision now that you know where you are. 8. Coach (to his wife): Brooke, I can’t provide you with a decent home. I can’t provide you with a decent car. I’m a failing coach with a losing record. And I can’t give you the children you want. [The problem] is me, like everything else is me. We can’t have our own children because of me. What’s God doing? I mean, why is it so hard? 9. Coach (praying in desperation): Lord Jesus, would you help me? I need you. Lord, I feel like there’s giants of fear and failure just staring down at me, waiting to crush me. And I don’t know how to beat ‘em, Lord. I’m tired of being afraid. If you want me to do something else, show me. If you don’t want me to have children, so be it. But you’re my guide. You’re on the throne [i.e., my king]. You can have my hopes and my dreams. Lord, give me something; show me something. 10. David: Dad, I don’t even know why they let me on the team. David’s Dad: Did you do your best, son? David: I knew I was going to miss it, even before I kicked it. David’s Dad: Your actions will always follow your beliefs, David. David: Dad, I can’t even kick it straight. David’s Dad: And I can’t walk. Should I just stay home and pout about it? If you accept defeat, David, then that’s what you’ll get. 11. Mr. Bridges (visiting the Coach’s office): Revelation Chapter 3 says: “We serve a God that opens doors that no one can shut, and he shuts doors that no one can open. He says: ‘Behold, I have placed before you an open door that no one can shut. I know you have a little strength, yet you have kept my word and have not denied my name.’” Coach Taylor, the Lord is not through with you yet. You still have an open door here, and until the Lord moves you, you’re to bloom right where you’re planted. I just felt led to come and tell you that today. Coach: Mr. Bridges. Do you believe God told you to come tell me that? Coach: I admit to you that I have been struggling. But I’ve also been praying. I just don’t see him at work here. Mr. Bridges: Grant, I heard a story about two farmers who desperately needed rain. And both of them prayed for rain, but only one of them when out and prepared his fields to receive it. Which one do you think trusted God to send the rain? Which one are you? God will send the rain when he’s ready. You need to prepare your field to receive it. Note: This story happens at a private “Christian School,” so most of the teachers/coaches/staff would be Christians. It is not unusual for one Christian to “feel led,” i.e., compelled by God, to go to another Christian with some encouraging sentences from the Bible. Christians believe the Bible is more than just a book, it is truth; and somewhere in there, God has given us advice and examples for how to face any “giant” if we are willing to trust Him to help us. In China, you do something similar when you quote a sage like Confucius (孔子), or some political leader. Some Americans would think that Mr. Bridges is just a “foolish old man,” but most Christians would listen and respect him, even if they aren’t really sure he is “hearing from God.” God speaks to us in often-mysterious ways! 13. Assistant Coach JT: David, you act like you’re gonna miss before you even kick the ball. We’re gonna have to change your whole kicking philosophy. See, you’re kicking wide left or wide right. But the ball has got to go through the middle. Now, what does Scripture [i.e., the Bible] say about this? Scripture says, “Wide is the gate and broad is the way that leads to destruction, and many there be that find it.” Now, to us, that’s wide left and wide right. [Coach Brady calls out sounds like some people do in church, to show support for the speaker.] Anybody, even my mama, can kick it wide left or wide right. But that ain’t what is gonna get you home. It don’t have to look pretty. It don’t have to look smooth. It can look like a dying duck. But the ball has got to go through the middle. Now, David, you gonna have to choose the narrow way. ‘Cause that’s the only path where you will get your reward. Now send this ball through these pearly posts. JT: Grant Taylor, somebody done gave you a new truck. Is this just ‘cause you is head coach. Because I’m assistant coach. You’d think I’d get a moped out of this or something. JT: By the way, some man called looking for you today. Brady: Stan Schultz – isn’t that a cartoonist? Brady Owens: Naw, Lindbergh is a cheese! Coach: Limburger’s the cheese. Lindbergh’s the man. JT: No, Lindbergh was that blimp that blew up and killed all them people. Brady: Nah, Hindenburg’s where you go skiing in Tennessee. JT: Gatlinburg? You mean like the country music group, the Gatlinburg Brothers? Coach: [throws ball] You guys are crazy. 16. University coach (Mark Richt): I don’t care what level of ball you’re coaching, it’s surreal when you make it to the championship game. Grant, I’m so proud of you and what you’ve done. I’ve been reading about the team and where you’ve gone. More than anything else, I’m just proud of the fact that you finally learned how to win the big one. Grant: We haven’t played them yet! University coach: You won the big one when you accepted Christ. Now, as you’re teaching these guys and ministering to them, I think it’s fantastic. I promise, win or lose this game, you guys are champions. Grant: This team we’re playing, they’re huge. They are fast, they’re strong. I just don’t want my players to be afraid. University coach: Well, in God’s word, he said 365 different times, “Do not fear.” If he says it that many times, you know he’s serious about it.